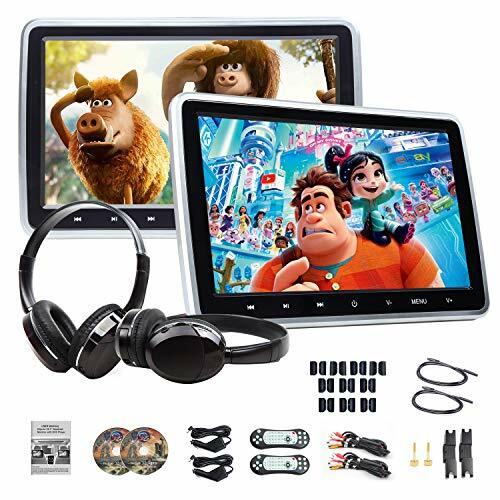 【More Fun】10.1" Headrest Monitor with DVD Player, Stylish Touch Buttons. Provide your family the extraordinary experience and differentiation service includes music, movie, game and etc. 【Easy Installation】 Fast Clip-on Installation, Applicable to any vehicle. DVD player can be easily mounted which just fix the bracket and twist the screws without affected the appearance of seat.All Eonon optional accessories/parts can be found here:https://www.amazon.com/eonon , If you have any problem,please contact us before purchase: us-techsupport@qq.com. 【Accessories】NOTICE:FOR THE MP4 VIDEO FILES, 1, please confirm the video file resolution is within 720X480, if it is high-definition video 720P or 1080P It cannot support it.English manual *1 , Multifunction remote controller *2, Cigarette Lighter Receptacle power cable *2 (Length: 2.5m) ,Power AV cable *2 (Length: 2m), AV extended cable *2 (Length: 82cm), Native 32 Bit Game disc *2, Bracket *2, 10mm/12mm/12.5mm/14mm/15mm Plastic Adapters (two pairs each size),Wireless IR Stereo Headset *2.